For centuries we as a nation of people have egocentrically perceived the issues that have plagued our United States of America. As Americans, it is our job to take responsibility for our actions while acknowledging periodic historical elements of repetition. The fault is with our apathetic nature in approaching concerning issues. Assuming, others are going to fix the problems we find traumatic and violent. For example: mass shootings, racial divides, police brutality etc. My proposed memorial idea will open the minds of society for a platonic bond. In addition, the memorial will start a much needed conversation amongst individuals of varying ethnic groups and socioeconomic backgrounds. Memorials capitalize off of empathetic minds who value the lives lost; however, they denote any ability to achieve change amongst the visitors attending the memorial site. Specifically, Holocaust museums selling merchandise to profit off of the memory of the tragic Final Solution instead of offering accurate insight of how it happened, who was involved, and how it can be prevented. My memorial will aim to attack all these issues for a generalizable memorial of America’s demise in the issues affecting our nation. 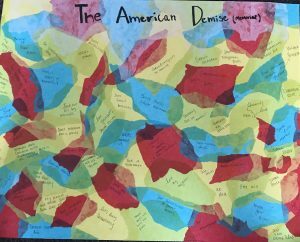 The American Demise Memorial will be an interactive design that identifies the current acts of violence penetrating our society. The explicit nature of the memorial design offers a change for a larger worldview on issues affecting not a sole number of people, but issues that affect one specifically. The idea is in order, so others can either identify or inquire more perspective from a person of a different group. Starting, a simple conversation with the issues people feel are afflicting our nation. Followed by, a write up of those issues. For reverence, the issues will be plastered on a wall in a collage by the writers. The memorial will offer artistic interpretation of the demise of our country, while giving a chance to talk to members of groups we may not identify with. The demise starts with people not talking to one another anymore. My memorial will offer that vital connection that is lacking among people of our generation current and past. The aim is to discuss issues and potentially coming up with a solution. While, remembering the deaths of those affected by our nation’s violent issues, followed by, how we as a society contributed to this demise. The location of the American Demise Memorial will be prompt in Times Square, New York City; however, my memorial will be a traveling venture. Allowing, various states to be exposed to the artistic interpretation of our interactive design. Thus, creating a larger group to be exposed to plutonic bonds with other ethnic nationalities. I sought to create the location in this way, because of the impact loudness will have on our nation. Keeping the memorial in one closed location will generate a crowd of similar individuals in the area, with the same ideas for change. Specifically, states are different in their political views as well. Our memorial wants to include a plethora of aspects in the nation we immerse ourselves in. In order to gain a larger and immediate perspective from all prospective intersectionality’s. The funding for the memorial will be provided by non-profit organizations willing to help contribute. Although, our memorial significance is a loud statement, we as a committee have acknowledge the issues we may come to face. Specifically, people who want to defame the memorial for its communist nature. However, the memorial is far from a communist movement. It is creating a better world with kinesthetic movement through art and communicable tangents that bring various ethnicities together. In addition, the American Demise memorial is promoting American conversation with one another. Thus, improving the plutonic bonds of our nation while leading others to an understanding of topics unbeknownst to them. Questions the committee has considered have been social concerns for the well-being of society. Those who are still strict on the view point of the white agenda may cause harm to those who participate in the memorial and vandalize. However, the notion of community is stressed throughout our memorial so police involvement will be practical, and necessary when having conversations of interest. In addition, they are not there to do a job, but if the opportunity presents itself we will appreciate their attendance further. The memorial aims to improve the United States, not divide the melting pot she has birthed. The proposed memorial design is important to our Holocaust and Genocide Studies class, because of the prevalence of genocide in our world today, the rise of authoritarianism in our current government rule and the lack of communication between generations/ethnic groups. My memorial design aims to tackle all these issues by facilitating a much needed conversation between individuals of various backgrounds. Due to privilege, and the ability to have so much or none at all, the lenses of societal view are very different for many ethnic groups. Complexity, comes from those lenses and the intersectionality of cultures and identities that may marginalize or privilege a person. Our superior end goal is to annihilate intersectionality, with time our committee finds this achievable. The intended audience is generalizable to everyone, because our nation needs to be present in the conversation we are proposing to present. Due to, the lack of communication within our nation, because of technological advancements, school age children to senior citizens can benefit from the American Demise Memorial. The importance of the American Demise Memorial is a play on words to address the issues afflicting our nation that we personally neglected/ingrained. Societal expectation and norms ignore the mentally ill by announcing deviancy, making those who suffer with a mental diagnosis to feel inept which leads them to pick up a gun. The weak gun control laws influence this behavior while denoting the facts, because of the political agenda. The example provided illustrates a snowball effect, which occurs in every aspect of humanity issues. In order to cancel the cyclonic pattern of issues plaguing our nation we need to have a conversation with one another. The American Demise memorial allows this plutonic connection to be formed by facilitating the safe space to concur with different intersectionality’s. The name is an artistic expression which allows for blame, but also change in the way we as individuals can gradually make the effort to better our nation. America’s lack of empathy comes from an egocentric lens when looking at perceived issues unbeknownst to one due to privilege. In addition, the plutonic conversation will allow those who dismiss their privilege, or do not identify as privileged, to see where other marginalized groups are coming from. The hope and need of this memorial is for a better understanding of our neighbors in the United States. With this memorial in place, change will follow. 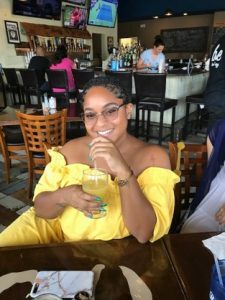 Ashlyn Brown is currently a student at Old Dominion University. Pursuing a double major in Psychology and Women’s Studies. She is striving for peace with remembrance throughout her various entries. In her free time, she enjoys reading and reality television. She hopes to grow in her understanding, throughout the class, of the various mass annihilations of diverse groups of people. She hopes to explore through: cultural, socio-economical, and psychological lenses. With her growth she intends to help others, while carrying the information, informing the public of unbeknownst injustices. Interesting idea to get people talking and thinking! We do have a huge diverse country, so your idea for having the memorial travel is a good one.